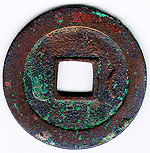 The Tang Dynasty's Kai Yuan Tong Bao set the basic pattern for all subsequent cash coins. 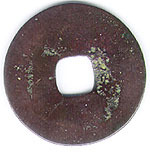 Coins with this legend on the face were officially minted over a few centuries into the late Tang. 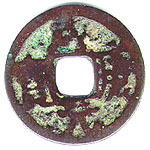 Furthermore the legend was occasionally used by later rulers and private counterfeiters all over East Asia. 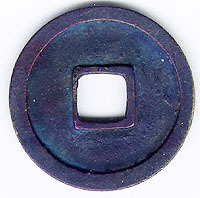 The varietiesof this coin are endless. 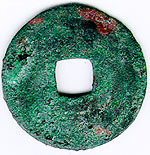 This coin is one of the early varieties the Kaiyuan Tongbao, where the top line of the bottome Yuan character is short. This is a particularly fine example belonging to Bill Dunkle who let me use the image. 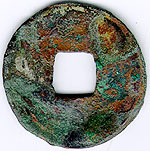 It is made of white copper which tends to rust bluish. 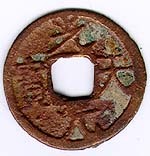 This is a lovely example of a a middle period Kaiyuan coin, when half moons started appearaing on the back of the coin. 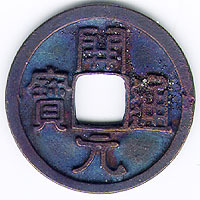 the greay blue patina highlights the characters very well, and the Tong character is written in a way to highlight the rhythmic waviness. 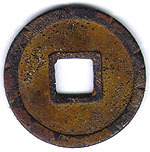 I like the dusty yellow patina on this Kai Yuan coin. This one is of the variety where the second stroke on the gen character flares up at the right instead of the left. 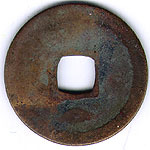 This coin has file markson the reverse side. These marks probably had some magical intent, such as a prayer for rain, but I do not know. 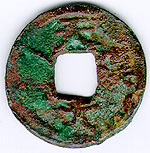 This coin is from a series minted from 845 in the late Tang dynasty. 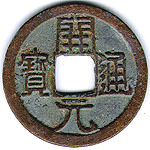 This series has coins with characters on the back referring to the mint names. 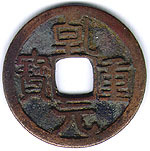 This coin has "Jing" on the back which is one of hte more uncommon varieties. 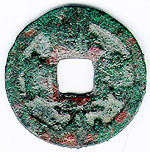 It also has a half moon on the bottom, which is not inthe jen catalogue, but is rather common anyhow.